Photographing the two little bridesmaids at this Deer Creek wedding in Oshawa was a delight, and a challenge. Most children respond one of two ways when they see a camera: either they are a little intimidated, or their goofy personality shines through (not always a good thing for formal portraits!). In order to make children feel more comfortable, I try to ignore them completely until they have a chance to get used to my presence. at that point, I am no longer a novelty worth watching. This is exactly what I try to achieve, as it gives me the freedom to capture them without their full awareness. Deer Creek golf club is a perfect wedding venue, as there is plenty of indoor decor behind which I can hide and wait for a scene to unfold. 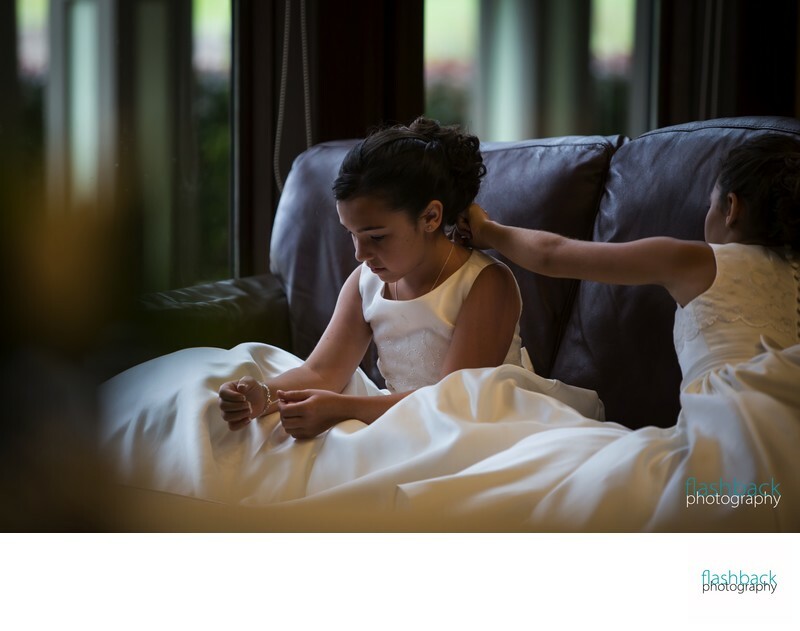 Moments like this scene with one flower girl fixing the other's necklace, are entirely unposed.